To place an order first choose the alphabet. If the rune alphabet that you like is not listed there is a chart buy the numbers. On the order spell out in english and let me know what alphabet. Colors and styles of rings/ Sizes and number of letters/runes ...that can be engraved by size. The only way your ring is going to be worn comfortably, is to have the correct size. We strongly suggest a trip to your local jeweler, to get your finger sized. If the ring you are purchasing is for a loved one, just borrow a ring and get it sized. 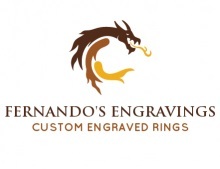 Any jeweler can do this for you. Remember once engraved you cannot return a ring to us for a refund or exchange. Every piece you order comes in it's own red velvet gift bag.